It is with a sense of sadness that I write this last Back-to-School message. 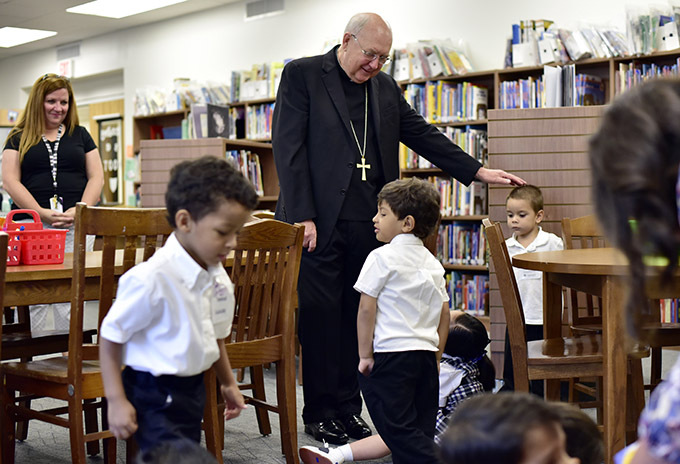 As I prepare to leave the Diocese of Dallas for Rome, I look at our Catholic schools with great joy and confidence. As a whole, they are one of the greatest blessings in our diocese. We have acted on many of the recommendations in that report including the combined formation of St. Philip & St. Augustine Catholic Academy in Pleasant Grove and Holy Family Catholic Academy in Irving. And, I am extremely pleased to have Cristo Rey beginning its second year of operation with great success and a waiting list. All of our schools continue to grow and expand. This year, as I prepare to assume a new post at the Vatican as Prefect of the Dicastery for the Laity, Family and Life, I especially empathize with the approximately 15,000 students who started the new school year at one of our schools. There is always a nervous excitement that comes with any new beginning. I hope and pray they will enjoy making new friends, meeting new teachers, and experiencing new challenges and opportunities. I ask parents to remember the words of Pope Francis that “the fundamental institutions for the education of children and youth are the family and the school.” Please never forget how important parents and family are to the success of students in the classroom. The educational journey begins at home with mom, dad and other family members serving as the first teachers. The Holy Father also points out that our children today are bombarded with so much information that families and teachers must help guide students to critical thinking and a moral compass. This is exactly where a faith-based education is needed. It is never lost on me that, for many students, a Catholic school education is literally life-changing. I would like to express my deepest gratitude to the committed teachers and administrators in our schools who are dedicated to the concept of a Christian, value-centered education for our children. These wonderful educators look on this special vocation as a sacred trust. I also sincerely thank all of the parents who sacrifice to provide a Catholic school education for their children, and I’m grateful to the many more that make sure their children attend faith formation classes at the parish. I have enjoyed working with our schools and I will miss visiting students, teachers, principals and parents at the various campuses. I ask you, as this new school year gets underway, to please join me in praying for all of our students and educators in Catholic and public schools throughout the Diocese of Dallas that this will be a year of great academic and spiritual growth.